One of the things marketing consultants and business coaches will tell you is to be yourself on social media and in your blogging. Let your tone come through and allow people to get to know you. Your personality will help you stand out. And it does, whether you have a good one or a bad one. But since you don’t want to potentially alienate customers you should know there are two extremes when it comes to marketing – the job candidate approach and the like-it-or-leave-it approach. The job candidate approach is when you are you, but better. That’s when you leave your dirty laundry at home with all of your rants. The like-it-or-leave-it mentality, on the other hand, believes that your personality is essential in targeting your ideal customer and if someone doesn’t like it, they can go elsewhere. One business that has capitalized on this approach and turned it into an art form is Ed Debevic’s in Chicago. 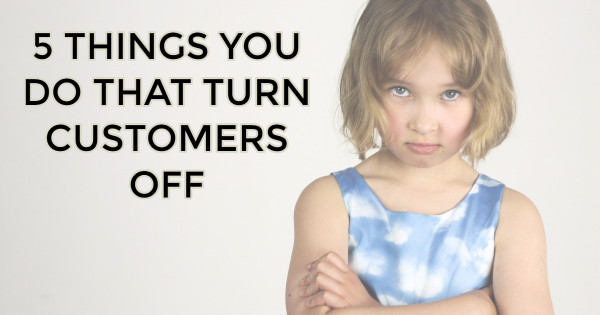 Most of us are probably in between those extremes, at least we think we are, but there are still things you may be doing that are causing you to lose customers. Nobody craves fine. No one goes out of their way for fine. If you’re just serving up a “fine” experience you’re not giving your customers anything to remember. I spend a lot of time on social media curating content for clients and I’m here to tell you there’s very little useful content out there. Too many businesses post things that don’t belong on social media. Things that are just about them with no helpful application to others. Follow the 80/20 rule – 80% of your content should be about other things or other people’s content and 20% should be your own. That 20% should entertain, educate, or inspire. Aim to help and you’ll become important to people. While you may not think that your customers care how you treat your employees (and you’re probably right), what they do care about is how they are treated by those employees. It’s important to know that disgruntled and unappreciated employees can NEVER provide excellent customer service. Here’s something else to chew on, according to a 2015 employee engagement study by Randstad, 28% of employees would rather have a better boss than a $5,000 raise. New research from the London School of Business and Finance reported 47% of the 1000 people polled disliked their jobs so much they are looking to leave in under a year. Some groups estimate as high as 77% of Americans dislike their jobs and dread Mondays. What does that tell you about your ability to offer good service? Speak in a language your audience understands. “Synergistic evaluations that leverage employee opportunities to think outside of the box” seems like “low-hanging fruit” but it will never make anyone buy from you. Automation helps businesses spend more time on things they can’t automate like personal relationships. Auto-attendants and websites can help you provide customers with the information they need without tying up manpower, but if your customers can’t get to what they need, those efficiency tools will prove much more frustrating than useful. Being yourself is important but so is knowing the preferences of your ideal customer. Once you know who that person is it’s a lot easier to give them what they need. But whatever it is that they need from you, know it is probably never going to be a self-promoting relationship. No customer has ever asked a business for that. Christina R. Green teaches small businesses, chambers, and associations how to connect through content. Her articles have appeared in the Associations North (formerly Midwest Society of Association Executives’) Magazine, NTEN.org, AssociationTech, and Socialfish. She is a regular blogger at Frankjkenny.com and the Event Manager Blog.